digital information and services for compliance with the university’s Digital Accessibility Policy. out of a web scanning tool, general administrative duties, and scheduling. • Working knowledge of HTML5 and CSS. (Novakowski.4@osu.edu): (a) cover letter and (b) resume by March 23, 2018.
summer term with the possibility of a longer appointment going forward. 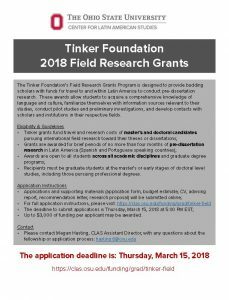 The Center for Latin American Studies is accepting applications for 2018 Tinker Field Research Grants, which can be used to provide graduate students with funds for travel to and within Latin America to conduct pre-dissertation research. Up to $3,000 per student may be awarded and the competition is open to all graduate students in all academic fields at Ohio State. A flyer is attached. 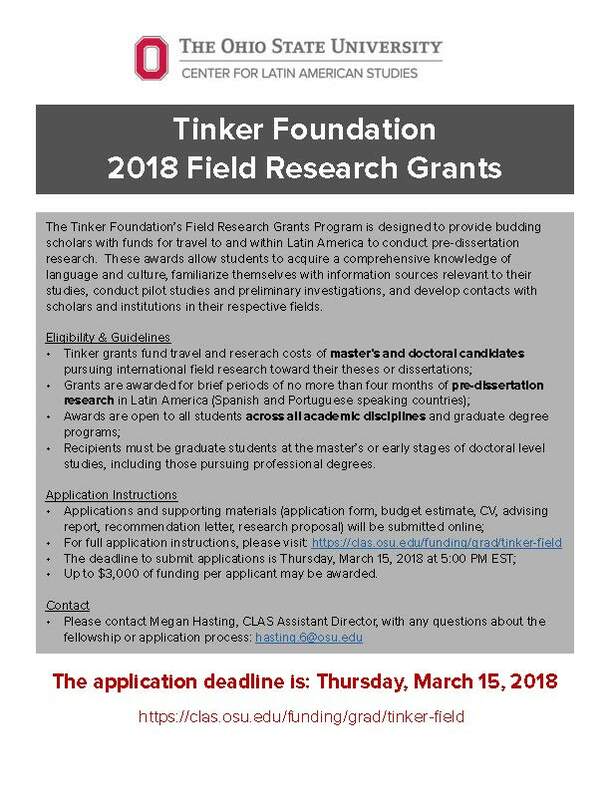 The deadline is Thursday, March 15, 2018 at 5:00 p.m. For more information, please visit: https://clas.osu.edu/funding/grad/tinker-field. The Research Committee of NAGAP is proud to announce a call for proposals for the annual NAGAP Graduate Student Research Grant. Up to two awards and two honorable mentions will be selected this year. This grant is open to current professional, masters or doctoral level students studying any topic relevant to the field of graduate education. This may include enrollment management topics such as alumni outreach, student retention, campus support services, faculty advising, technology, leadership, financial aid, internationalization, holistic admissions, student recruitment, etc. Proposal instructions may be found on the NAGAP Website. Please contact Paula Baker with any questions. Lastly, please forward this opportunity to any student eligible under the guidelines. Thank you for working with NAGAP to continue to be leaders in understanding and supporting the Graduate Enrollment Management profession. All applications must be submitted by Wednesday, Feb. 28, 2018. Thank you, in advance, for your participation in this process! The Intelligence Community (IC) Postdoctoral Research Program is accepting applications through March 12, 2018. The Program supports postdocs to conduct research at universities, colleges, and U.S. government laboratories throughout the United States. Recent Ph.D. graduates or doctoral students who will soon complete their degrees are encouraged to apply. The fellowships offer a very competitive annual stipend and an annual travel allowance for the Postdoc, as well as a stipend and travel allowance to the host institution. We appreciate any assistance in helping us identify competitive candidates for these prestigious fellowships. · Annual stipends range from $75,000 to $79,000, depending on research location. · Host institutions receive an annual laboratory budget of up to $5,000. · Research advisors receive a $10,000 stipend and an annual travel budget of up to $2,000. 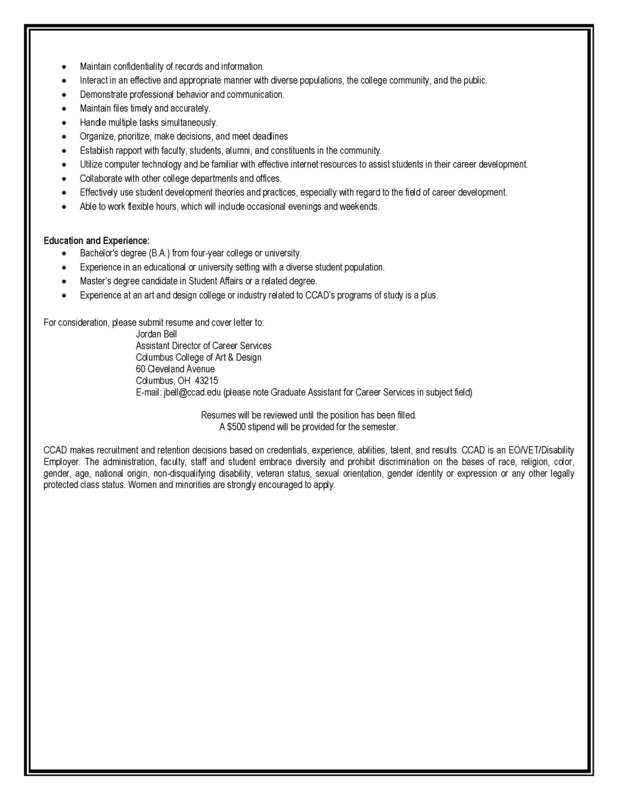 Please visit the website(https://www.orau.org/icpostdoc/applicants/index.html) for details, and feel free to share this e-mail with your colleagues. 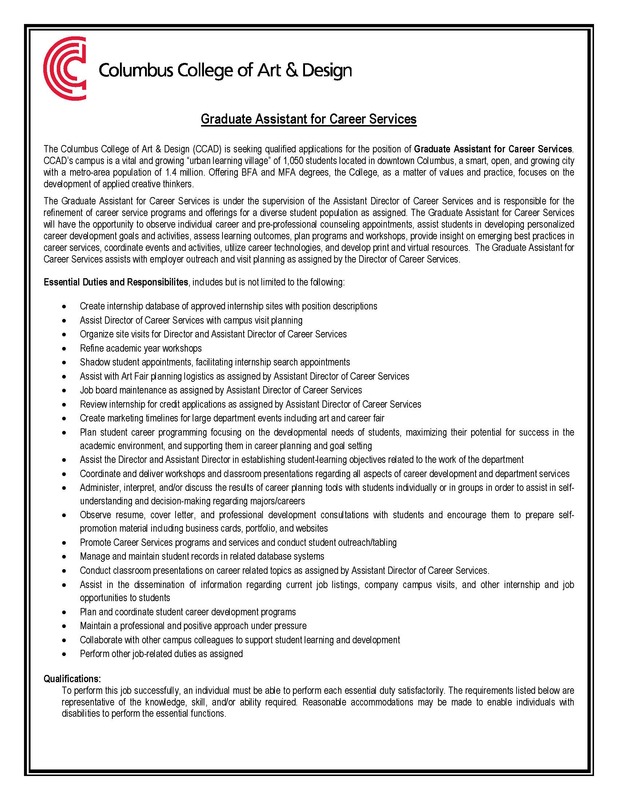 We request that you share this opportunity with your graduate and professional students. Graduate or professional students interested in making a difference in local communities are encouraged to apply for the Columbus-Athens Chapter of the prestigious Albert Schweitzer Fellowship. Schweitzer Fellows partner with community organizations to create and implement year-long, 200-hour service projects that address social and health-related needs in Franklin and Athens counties. The Columbus-Athens Albert Schweitzer Fellows program director and representatives will be on hand to provide a program overview and answer questions. For more information, contact Maria Gallo or Lizzie Fitzgerald, Columbus-Athens Albert Schweitzer Fellows Program Directors, at Columbus-AthensASF@osu.edu. The grant competition is now open for the 2018-2019 Coca-Cola Critical Difference for Women Grants. The Department of Women’s, Gender and Sexuality Studies administers these research grants, which are designed to support research by Ohio State faculty and graduate students that explores women’s lives, gender equity and gender broadly conceptualized. Proposals are encouraged from all departments, colleges and professional schools. Priority may be given to research that includes a focus on diversity or on issues and groups that remain understudied. The Office of International Affairs is seeking applications for its Academic Enrichment International Research Grants, which support activities with lasting impact across the globe. The grant competition is open to faculty, graduate students and undergraduates whose applications focus on research projects that address global issues, connect discipline-specific research to programs in diverse cultural settings, explore the languages, cultures, arts, social sciences and area studies and/or promote active collaborations with institutional partners. Deadline to apply is Friday (2/9). I wanted to pass along a GRA opportunity for Spring 2018 in the Department of Engineering Education. Qualifications are below and attached. If you would be able to send this to the EHE listerv, it would be most appreciated. The graduate research associate (GRA) will be responsible for the revision and launch of a national survey exploring the persistence of women engineering faculty in institutions in the United States. The GRA will be responsible for recruitment of women for the survey, for creating an on-line version of the survey on the project’s website, and for interpreting findings using an intersectionality framework (i.e., race, class, and gender). The GRA(s) will assist in conducting literature reviews and project publications. Completion of at least two years of coursework in educational psychology, quantitative research, evaluation, and measurement, or related fields. *If the selected researcher has not completed Institutional Research Board (IRB) training, he/she will be required to successfully complete the training during the first week of employment. Cover letter and CV including the list of courses taken; Writing sample; Names and contact information of at least 3 professional references. Send materials electronically to Dr. Monica F. Cox at cox.1192@osu.edu. Review of applications begin immediately and will conclude when a qualified candidate is hired. Are you currently funded by the Department as a GTA, Departmental GRA (not grant-based), or GAA and want to apply for funding next year? Do you not currently have an Assistantship but wan to apply for one for next year? 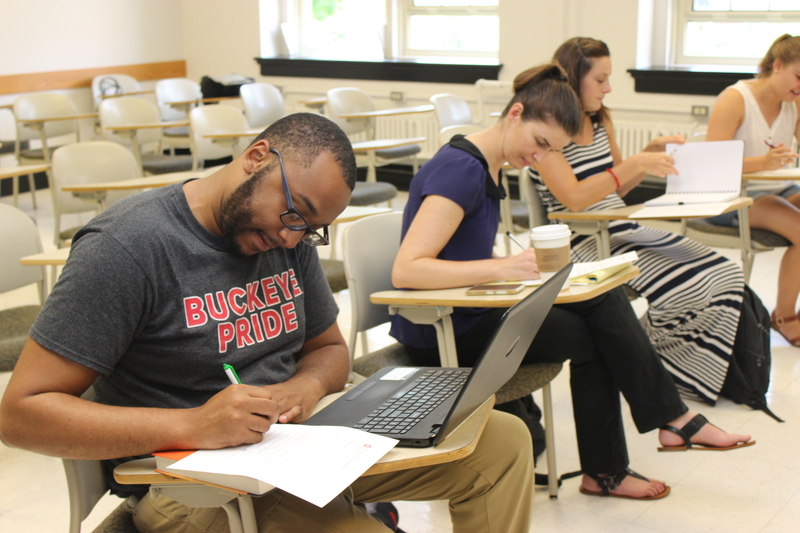 The Department’s Application for Graduate Assistantships for 2018-2019 is now open and available at http://go.osu.edu/esGTAapp. The deadline to apply is January 2, 2018 at 11:59pm. 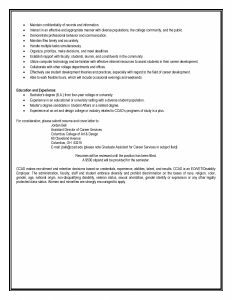 ALL students interested in a Departmentally-funded GA position next year MUST complete the application, even if you currently have a position and hope to return to the same position next year. We have made a few changes to the application this year. The most substantial change is that you now must write a Statement of Interest and Qualifications for each position you choose to apply to. Position descriptions have been posted giving an outline of each position and the minimum qualifications to be hired for that position. With these changes, be sure to allow yourself sufficient time to complete the application before the deadline. I submitted an application and realize I need to change something? I’m not sure if the application submitted? Please reach out to Billy Welch. welch.372@osu.edu, if you have questions regarding the GA Application or the GA Application process. 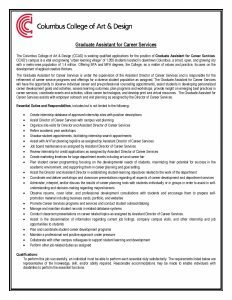 Columbus College of Art & Design’s Career Services office is looking for a graduate assistant to start Spring 2018. I’ve attached a description here. Interested students can send their interest directly to me. The description is rather broad and includes a lot. We will be flexible with classes and professional interests to focus the position on areas where the student is most interested in gaining experience. Please share with your graduate level students. Thank you!